The office layout is in N scale. Due to a spur of the moment purchase a Kato RDC found its way to me. I'll write more about the purpose of this guy some other time. Tonight I installed a DCC decoder in the RDC . What a giant pain for such a small model. The model is held together only by clips. Disassembly is impressively hard. Keeping the clips intact is even harder. 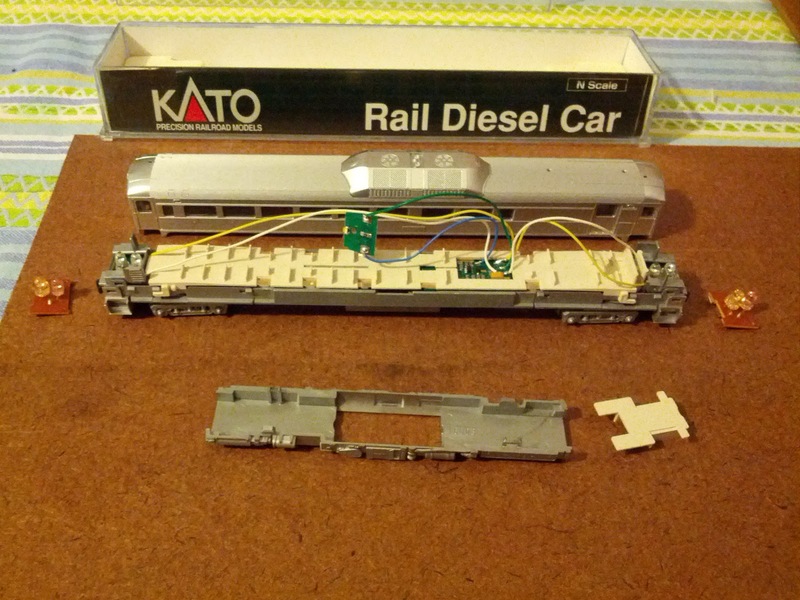 Either way, after reviewing forum posts, the Kato disassembly instructions, and the Digitrax installation instructions, the decoder is ready for testing on the layout. Following some forum advice I removed the underbody part to reach the clips for the seat panel more easily. That was a very good move. The Digitrax product description did say this is a challenging install "due to the nature of the model". I guess I'll find out soon if I can manage to do challenging installs successfully. Update 1/29/2013: I tested the decoder on the layout in the meantime. One light board was slightly off the connectors (easily fixed), but otherwise the RDC ran just fine. The motor parameters do need some tuning. Though that can be easily accomplished when it's put together.